Background: Transcatheter arterial chemoembolization (TACE) is an effective first-line therapy for intermediate stage hepatocellular carcinoma (HCC). 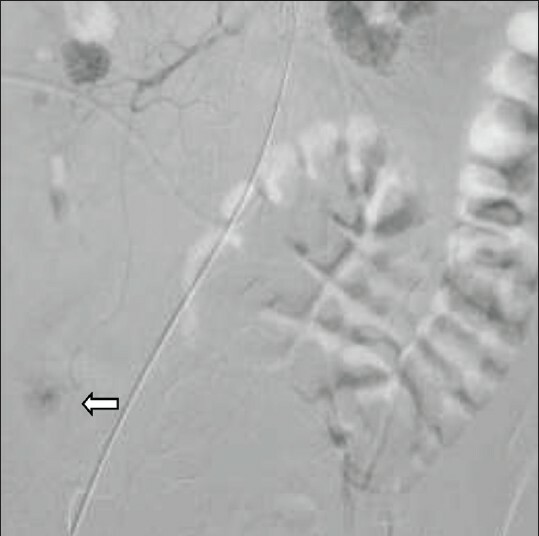 Acute renal injury may be induced after transarterial chemoembolization because of iodinated radiocontrast medium, but its incidence, risk factors, and prognosis remain unclear. Patients and Methods: This prospective study enrolled 166 HCC patients with a total of 316 TACE treatments. The incidence, risk factors, and prognosis of acute kidney injury (AKI) were examined. Results: The incidence of post-TACE AKI was 21.84% (69/316) according to Barrett and Parfrey criteria, whereas 7.59% (24/316) according to acute kidney injury network (AKIN) criteria. 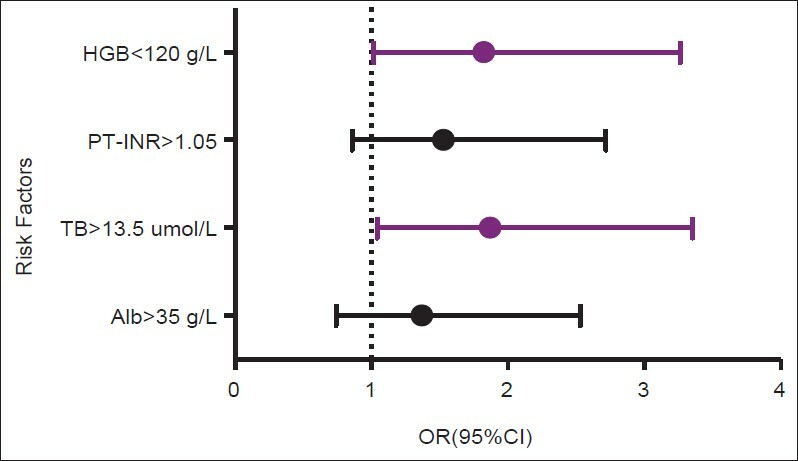 Multivariate logistic regression analysis showed that serum total bilirubin (TB) (>13.5 μmol/L; odds ratio [OR]: 1.871 95% confidence interval [CI]: 1.044-3.352; P = 0.035) and hemoglobin (HGB) level (<120 g/L; OR: 1.823, 95% CI: 1.019-3.264; P = 0.043) were associated with the development of AKI after TACE procedure in accordance to Barrett and Parfrey criteria. Meanwhile, age (>55 years; OR: 3.456, 95% CI: 1.107-10.790; P = 0.033), post-TACE AKI history (OR: 7.108, 95% CI: 1.387-36.434, P = 0.019), and serum aminotransferase level (>55 U/L; OR: 4.420, 95% CI: 1.792-10.906; P = 0.001) were associated with the development of AKI after TACE procedure in accordance to AKIN criteria. Total hospitalization cost was significantly higher (P = 0.034) in the patients with AKI after TACE procedure according to Barrett and Parfrey criteria. A post-TACE AKI diagnosis was associated with mortality in any definition used (P = 0.034 and P = 0.001 for Barrett and Parfrey and AKIN criteria, respectively). Conclusion: The present study showed that the incidence of post-TACE AKI was high in HCC patients (i.e., 7.59-21.84%) depending on criteria used. HGB (<120 g/L), serum TB (>13.5), and aminotransferase level (>55 U/L), age (>55 years) and post-TACE AKI history may be predictors of post-TACE AKI in HCC patients. The development of post-TACE AKI was associated with the risk of renal replacement treatment, prolonged renal insufficiency, or mortality according to AKIN criteria. 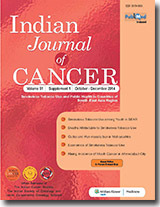 Purpose: The aim was to evaluate the safety, feasibility and efficacy of computed tomography (CT)-guided percutaneous interstitial brachytherapy using radioactive iodine-125 ( 125 I) seeds for the treatment of lung cancer. Materials and Methods: Included in this study were 45 male and 35 female patients aged 52-85 years (mean 72-year) who were diagnosed with lung cancer. Of the 80 cases of lung cancer, 38 were pathologically confirmed as squamous cell carcinoma, 29 as adenocarcinoma, 2 as small cell lung cancer, and 11 as metastatic lung cancer. Percutaneous interstitial implantation of radioactive 125 I seeds was performed under CT guidance. The treatment planning system was used to reconstruct three-dimensional images of the tumor to determine the quantity and distribution of 125 I seeds to be implanted. Under CT guidance, 125 I seeds were embedded into the tumor, with the matched peripheral dose set at 100-130 Gy. Follow-up CT scan was done in 2-month to explore the treatment efficacy. Results: The procedure was successful in all patients. No major procedure-associated death occurred. The duration of follow-up was 6-month. Complete response (CR) was seen in 38 cases (47.5%), partial response (PR) in 27 cases (33.75%), stable disease (SD) in 10 cases (12.5%), and progressive disease in 5 cases (6.25%), with a local control rate (CR + PR + SD) of 93.75%. The 2-, 4- and 6-month overall response rate (CR + PR) was 78%, 83% and 81%, respectively. 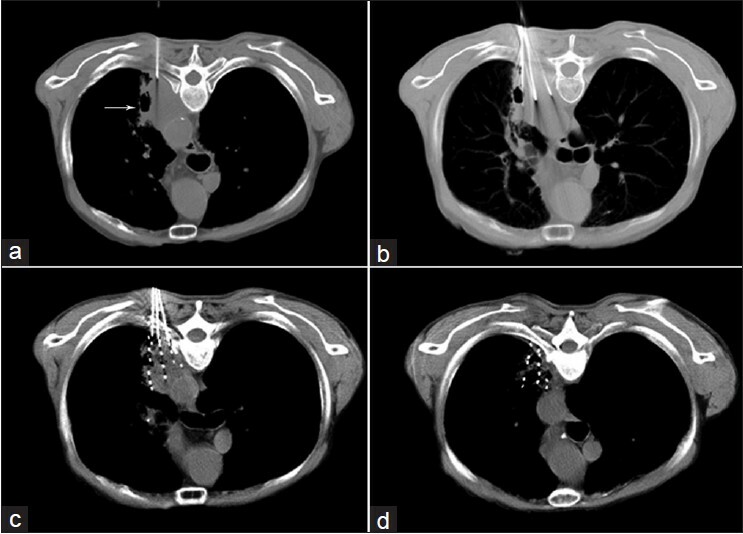 Conclusion: Implantation of CT-guided 125 I seeds is a safe and effective alternative option for the treatment of lung cancer. 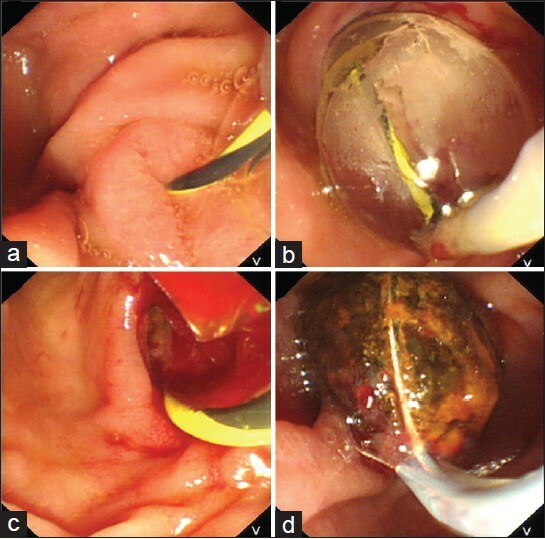 Background: Several comparison studies have demonstrated that endoscopic sphincterotomy (EST) combined with large-balloon dilation (LBD) may be a better option than EST alone to manage large bile duct stones. However, limited data were available to compare this combination method with LBD alone in removal of large bile duct stones. Objective: To compare EST plus LBD and LBD alone for the management of large bile duct stones, and analyze the outcomes of each method. Patients and Methods: Sixty-one patients were included in the EST plus LBD group, and 48 patients were included in the LBD alone group retrospectively. The therapeutic success, clinical characteristics, procedure-related parameters and adverse events were compared. Results: Compared with EST plus LBD, LBD alone was more frequently performed in patients with potential bleeding diathesis or anatomical changes (P = 0.021). The procedure time from successful cannulating to complete stone removal was shorter in the LBD alone group significantly (21.5 vs. 17.3 min, P = 0.041). The EST plus LBD group and the LBD alone group had similar outcomes in terms of overall complete stone removal (90.2% vs. 91.7%, P = 1.000) and complete stone removal without the need for mechanical lithotripsy (78.7% vs. 83.3%, P = 0.542). Massive bleeding occurred in one patient of the EST plus LBD group, and successfully coagulated. Postoperative pancreatitis did not differ significantly between the EST plus LBD group and the LBD alone group (4.9% vs. 6.3%; P = 1.000). Conclusion: Endoscopic sphincterotomy combined with LBD offers no significant advantage over LBD alone for the removal of large bile duct stones. LBD can simplify the procedure compared with EST plus LBD in terms of shorten the procedure time. 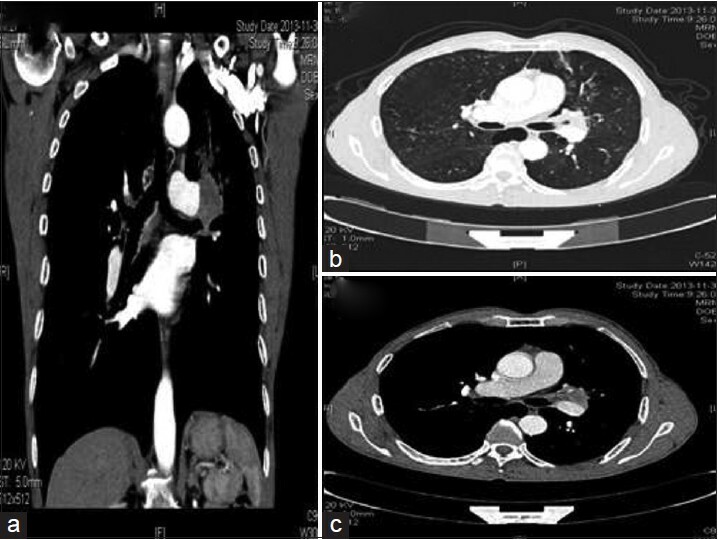 Background: We review our experiences with video-assisted thoracoscopic surgery (VATS) sleeve lobectomy with bronchoplasty for nonsmall-cell lung cancer, using only two incisions. The aim of this study was to evaluate the technical feasibility and safety of surgical approach. Materials and Methods: From January 2013 to January 2014, we completed 15 cases of VATS sleeve lobectomy with bronchoplasty in our hospital. The patients underwent sleeve lobectomy with bronchoplasty at the following locations: right upper lobe (n = 4), right lower and middle lobes (n = 1), left lower lobe (n = 5), and left upper lobe (n = 6). The operation consisted of VATS anatomic sleeve lobectomy with bronchoplasty combined with systematic lymph node dissection, using only two incisions. Results: The patients underwent sleeve lobectomy with bronchoplasty were no postoperative complications. Median operative time was 183 min; median bronchial anastomosis time was 39 min; median blood loss was 170 ml. Pathological examination showed 12 squamous cell carcinomas and 3 adenocarcinoma. Median postoperative chest tube drainage duration was 4.5 days, and median hospital stay was 6.9 days. Conclusions: Video-assisted thoracoscopic surgery sleeve lobectomy with bronchoplasty is a feasible and safe surgical approach, using only two incisions. This way of operation can promote the development of surgical technology. Introduction: The aim of this meta-analysis was to further explore whether the relapse, 5-year survival and metastasis the same or not between limb-salvage and amputation in the treatment of patients with limited stage Enneking‡U pathologic fracture osteosarcoma. Materials and Methods: An electronic search of the Medline, EMBASE and CNKI was done on October 2014. The clinical studies about amputation or limb-salvage surgery in the treatment of patients with limited stage Enneking‡U pathologic fracture osteosarcoma were searched and reviewed. 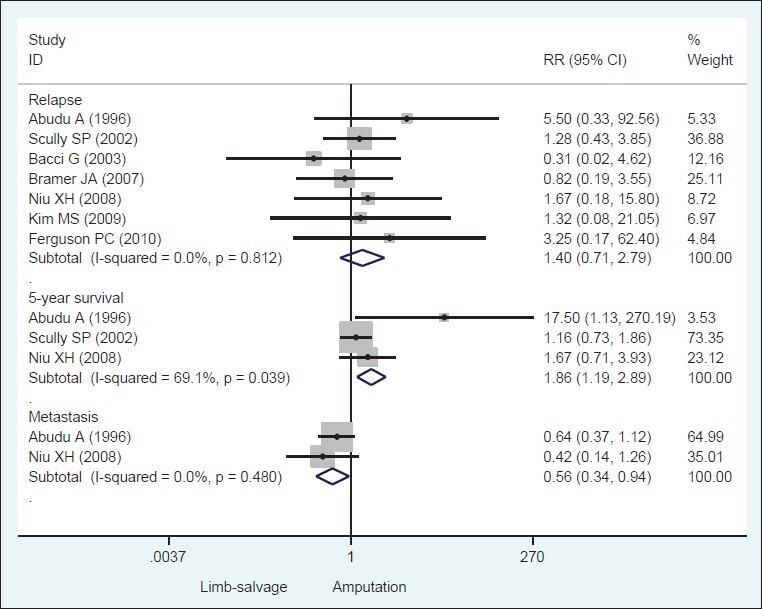 The effect size of relapse, 5-year survival and metastasis between the amputation and limb-salvage surgery were pooled by stata11.0 software (Stata Corporation, College Station, TX, USA, http://www.stata.com;) using random or fixed effect model. The funnel plot and Egger's line regression test were used for evaluation of publication bias. Results: A total of 89 studies were identified and seven articles with 200 cases in the limb-salvage surgery group and 84 subjects in the amputation group were finally included in the meta-analysis. The pooled data indicated that no statistical different of risk for developing relapse between limb-salvage and amputation was found relative risk (RR) =1.40, 95% confidence interval (CI): 0.71-2.79, (P = 0.33). The 5-year survival rate of patients underwent limb-salvage surgery was smaller than patients received amputation RR = 1.86, 95%CI: 1.19-2.89, (P = 0.01); the metastasis rate of patients underwent limb-salvage surgery was significant decreased compared with patients received amputation RR = 0.56, 95% CI: 0.34-0.94, (P = 0.03). No publication bias was existed in this meta-analysis. Conclusion: Limb-salvage surgery does not increased the risk of relapse compared with amputation in the treatment of patients with limited stage Enneking‡U pathologic fracture osteosarcoma. Objective: Minimally invasive esophagectomy (MIE) is becoming a selective treatment of esophageal cancer; however, it's a complex and technically demanding surgical operation. MIE can be performed in high volume centers in a variety of ways using different techniques. Transthoracic staplers have traditionally been used in open transthoracic Ivor Lewis Esophagectomy (ILE) with good success. An investigation of the safety and utility of transthoracic stapler via two ports on thorax for esophageal anastomosis in minimally invasive ILE is reviewed. Methods: Patients of esophageal cancer were selected between November 2012 and July 2014. All the patients received minimally invasive (MIE) or open transthoracic ILE. 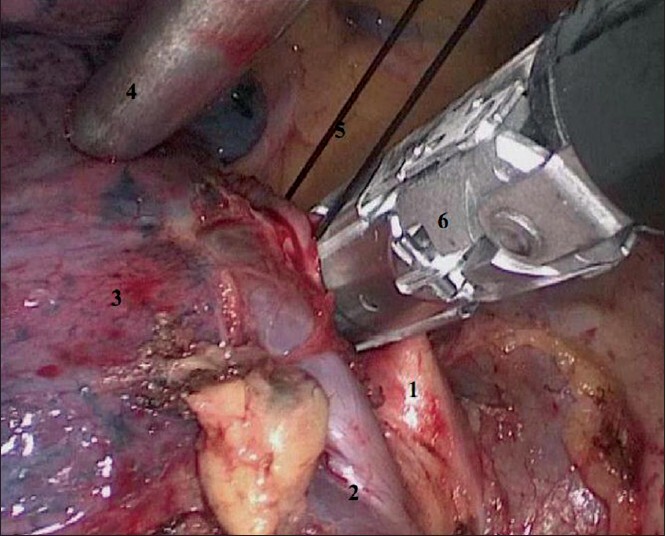 Transthoracic stapler for MIE anastomosis was performed through the major port located at subaxillary region. Patients' demographics, indications for esophagectomy, perioperative treatments, intraoperative data, postoperative complications, hospital length of stay, 7 and in-hospital mortality were evaluated. Results: Totally, 63 consecutive patients underwent MIE or ILE. All the patients were Han with a mean age of 60 years (52-74). The indication of surgery is esophageal cancer, and squamous cell carcinoma was defined by pathologist before operation. None of the patients had neoadjuvant chemotherapy or radiation. All the MIE patients were no conversions to open thoracotomy or laparotomy. Mean operative time was 4.5 h. One patient (3.03%) suffered postoperative pneumonia, no leak from the gastric conduit staple line or esophageal anastomoses, no postoperative complication required surgical intervention was observed. The median hospital length of stay was 13 days (range 7-18). There were no in-hospital mortalities. Conclusions: In our study, transthoracic stapler through the major port at subaxillary seems technically feasible and safe for minimally invasive ILE with comparable morbidity and oncologic data to open. Objectives: The objective was to explore clinical effect of limited resection of lung lobe under the thoracoscopy in the treatment of early nonsmall cell lung cancer occurred in the old age. Methods: A total of 150 patients with nonsmall cell lung cancer in the old age is treated by limited resection of lung lobe under thoracoscope. It can be divided into segmental resection group and wedge resection group by surgical methods, to make a comparative analysis of operation time, intraoperative blood loss, hospital stays, and complications during the perioperative period. And there will be postoperation follow-up on survival, relapse and death situation etc., Results: 10 cases are changed to make other operation because of maladaptation to limited resection, and a total of 140 patients have undergone limited resection. Operation time and hospital stays of wedge resection group are shorter than those of segmental resection group (P < 0.05); compared with the bleeding and indwelling drainage tube time in two groups, differences have no statistical significance (P > 0.05). Compared with cases of complications, recurrence and death for groups of segmental resection and wedge resection group, the differences have no statistical significance (P > 0.05). Conclusion: Limited resection of lung lobe in the early treatment of nonsmall cell lung cancer occurred in the old age under the thoracoscopy is safe and feasible. Objective: This study aimed to evaluate the outcome of benign vocal cord tumors treated using a laryngeal endoscopy under low temperature-controlled radiofrequency and to elucidate the application of a dynamic laryngoendoscopy in the operation. Materials and Methods: 85 patients with benign vocal cord tumors were treated by laryngeal endoscopy under low temperature-controlled radiofrequency from September 2011 to October 2013. A XION electronic dynamic laryngoendoscopy (Germany) was used to observe curative effects 3 months after operation. Wave images were recorded with larynx-wave recording software to analyze tumor characteristics. Results: Among the 85 patients, 81 showed smooth surface of operation wounds without any residue. The mucosal wave was also basically normal. Sound was generally recovered after 1-3 months. Three cases presented improved pronunciation function after the operation, whereas 1 patient with residual tumor at the front of vocal chords underwent another operation after 6 months. Conclusion: Low temperature-controlled radiofrequency exhibited many advantages, including minimal trauma, minimal bleeding, high safety, and few complications. Moreover, treatment of benign vocal cord tumors with a laryngeal endoscopy presented satisfactory outcomes. Therefore, this technology has broad application prospects. Objective: To investigate the feasibility, safety and short term efficacy of video assisted thoracoscopic (VATS) lobectomy for patients with early-stage lung cancer. Methods: We reviewed clinical data of 138 consecutive patients with early stage lung cancer who underwent lobectomy in the First People's Hospital of Jining during the January 2010 to May 2012. Of them, 71 cases were performed complete VATS, male 39 cases, female 32 cases, age (57.9 ± 10.6) years old; 67 cases were performed thoracotomy, male 36 cases, female 31 cases, age (60.3 ± 8.2) years old. Clinical features were collected and compared. Results: Operations of two groups were successfully finished. Compared with thoracotomy group, the differences in intraoperative blood loss (147 ± 113 ml vs. 146 ± 91 ml), number of lymph node dissection group (3.1 ± 1.3 vs. 3.4 ± 1.3), the number of lymph node dissection (9.9 ± 3.6 vs. 10.0 ± 3.6), and vision analog score (VAS) of postoperative 1st and 3rd day in VATS group were not statistically significant (P > 0.05). Statistical differences were observed in operation time (119 ± 27 min vs. 135 ± 29 min), the thoracic drainage tube time (3.0 ± 0.9 d vs. 3.8 ± 1.2 d), postoperative hospital stay (8.0 ± 2.1 d vs. 10.2 ± 5.4 d), postoperative VAS of 30th day (2.6 ± 0.7 vs. 3.2 ± 1.1), and postoperative complications (8.5% vs. 19.4%) between the two groups (P < 0.05). Conclusion: Video assisted thoracoscopic lobectomy for early lung cancer is safe and effective, with fewer traumas, fewer complications, faster postoperative recovery, milder chronic chest pain, and other advantages. At the same time, the lymph node dissection of VATS lobectomy is similar to that of thoracotomy. Introduction: Whether the incidence rate of deep venous thrombosis (DVT) between laparoscopic and open colorectal cancer surgery the same or not were under the debated without conclusion. The aim of this study was to compare the incidence of DVT after laparoscopic or open colorectal cancer surgery by meta-analysis. Materials and Methods: The open published articles comparing the incidence of DVT after laparoscopic or open colorectal cancer were collected in the data bases of Medline, the Cochrane central register of controlled trials and CNKI. The relative risk (RR) was pooled by using random or fixed effect mode to evaluate the incidence of DVT between laparoscopic or open colorectal cancer surgery.Results: After searching the databases, 9 randomized clinical studies with 2606 colorectal cancer cases were included in this meta-analysis. The mean operation time was 201.8 ± 17.28 min with its range of 180.0-224.4 min in the laparoscopic surgery group and 148.1 ± 18.8 min with its range of 135.0-184.0 min in the open surgery group. 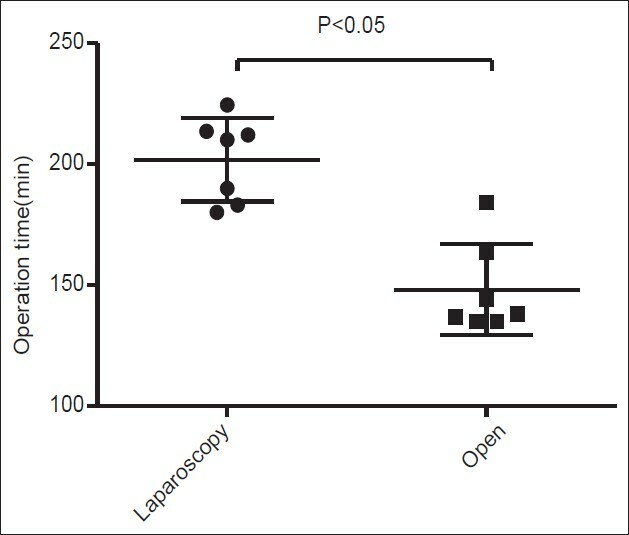 The operation time for laparoscopic surgery group were significant lower than in the open surgery group (P < 0.05). The RR of DVT between the laparoscopy and open surgery groups was 0.71 with its 95% confidence interval of 0.35-1.45 (P = 0.35). Conclusions: The operation time in laparoscopic colorectal cancer surgery was statistical longer than in the open colorectal cancer surgery, but the DVT risk of the two surgery approach was not different according to this meta-analysis. Background: Diaphragmatic dysfunction and its negative physiologic disadvantages are less commonly reported in patients with lung cancer video-assisted thoracoscopic lobectomy. The aim of this study was to investigate the outcomes of this complication on pulmonary function and quality-of-life in patients following video-assisted thoracoscopic lobectomy. Objectives: The aim of this study was to investigate potential benefits on pulmonary function and quality-of-life with normal diaphragmatic motion. Materials and Methods: A retrospective study was conducted in 64 patients with nonsmall cell lung cancer after video-assisted thoracoscopic lobectomy. The population were divided into groups 1 (with diaphragmatic paralysis, n = 32) and group 2 (without diaphragmatic paralysis, n = 32) according diaphragmatic motion after postoperatively 6 months. And then, we investigated the difference between the two groups on pulmonary function and quality-of-life. Results: (1) At 6 months after resection, the patients in group 1 had lost 25% of their preoperative forced expiratory volume in the 1 s (FEV 1 ) (P < 0.001), and the patients in group 2 had lost 15% of their preoperative FEV 1 (P < 0.001). And the other spirometric variables in group 1 were significantly worse than that of group 2 (P < 0.001). (2) The most frequently reported postoperative symptoms were fatigue, coughing, dyspnea, and thoracotomy pain in two groups. Of all the symptom scales, only the dyspnea scale showed a significant difference which subject has a higher proportion and scale compared to control. Conclusions: The present study indicates that unilateral diaphragmatic paralysis following video-assisted thoracoscopic lobectomy caused adverse effects on postoperative pulmonary function and quality-of-life. Background: Transarterial chemoembolization (TACE) has been used to treat unresectable massive hepatocellular carcinoma (HCC). Lots of embolic agents have been applied in embolization because of it can decrease patient discomfort and side-effects. Aim: The aim was to evaluate the clinical efficacy and safety of TACE with lipiodol and gelatin sponge. Materials and Methods: A total of 109 patients with massive HCC (the size of tumor >10 cm and unresectable) from January 2011 to August 2014 in our institution was divided into group A and group B based on the different embolitic agents. Before and about 1-month after each case of TACE, clinical and biological data such as tumor size, child-pugh stage, serum Alpha-fetoprotein (AFP), complications, were recorded at the same time. Results: In group A, the diameter of the tumor reduced from 12.57 ± 1.26 cm to 9.04 ± 0.89 cm. No patient was complete response (CR), partial response (PR) 36, stable disease (SD) 7 and PD 6; in group B, the diameter of tumor decreased from 12.08 ± 1.42 cm to 8.43 ± 1.05 cm, CR 0, but PR 27, SD 18 and PD 15. RR in group A was significantly higher than in group B (P < 0.05).The change of child-pugh stage and AFP pre- and post-operative in group A can be found significantly better than in group B. Conclusions: TACE with lipiodol and gelatin sponge is a highly effective for massive HCC. Background and Aims: In recent years, submucosal tunneling endoscopic resection (STER) was applied more and more often for single gastrointestinal (GI) submucosal tumor (SMT). However, little is known about this technique for treating multiple SMTs in GI tract. In the present study, we investigated the feasibility and outcome of STER for upper GI multiple SMTs originating from the muscularis propria (MP) layer.Patients and Methods: A feasibility study was carried out including a consecutive cohort of 23 patients with multiple SMTs from MP layer in esophagus, cardia, and upper corpus who were treated by STER from June 2011 to June 2014. Clinicopathological, demographic, and endoscopic data were collected and analyzed. Results: All of the 49 SMTs were resected completely by STER technique. Furthermore, only one tunnel was built for multiple SMTs of each patient in this study. En bloc resection was achieved in all 49 tumors. The median size of all the resected tumors was 1.5 cm (range 0.8-3.5 cm). The pathological results showed that all the tumors were leiomyoma, and the margins of the resected specimens were negative. The median procedure time was 40 min (range: 20-75 min). Gas-related complications were of the main complications, the rates of subcutaneous emphysema and pneumomediastinum, pneumothorax, and pneumoperitoneum were 13.0%, 8.7% and 4.3%. Another common complication was thoracic effusion that occurred in 2 cases (8.7%), among which only 1 case (4.3%) with low-grade fever got the drainage. Delayed bleeding, esophageal fistula or hematocele, and infection in tunnel were not detected after the operation there were no treatment-related deaths. The median hospital stay was 4 days (range, 2-9 days). No residual or recurrent lesion was found during the follow-up period (median 18, ranging 3-36 months). Conclusion: Submucosal tunneling endoscopic resection is a safe and efficient technique for treating multiple esophageal SMTs originating from MP layer, which can avoid patients suffering repeated resections. Background: Endovascular embolization has been used to control gastrointestinal tumor bleeding. Lots of embolic agents have been applied in embolization, but liquid embolic materials such as Onyx have been rarely used because of concerns about severe ischemic complications. Aim: To evaluate the clinical efficacy and safety of transcatheter arterial embolization (TAE) with Onyx for acute gastrointestinal tumor hemorrhage. Materials and Methods: Between September 2011 and July 2013, nine patients were diagnosed as acute gastrointestinal tumor hemorrhage by clinical feature and imaging examination. The angiographic findings were extravasation of contrast media in the five patients. The site of hemorrhage included upper gastrointestinal bleeding in seven cases and lower gastrointestinal bleeding in two cases. TAE was performed using Onyx in all the patients, and the blood pressure and heart rate were monitored, the angiographic and clinical success rate, recurrent bleeding rate, procedure related complications and clinical outcomes were evaluated after therapy. The clinical parameters and embolization data were studied retrospectively. Results: All the patients (100%) who underwent TAE with Onyx achieved complete hemostasis without rebleeding and the patients were discharged after clinical improvement without a second surgery. No one of the patients expired during the hospital course. All the patients were discharged after clinical improvement without a second surgery. 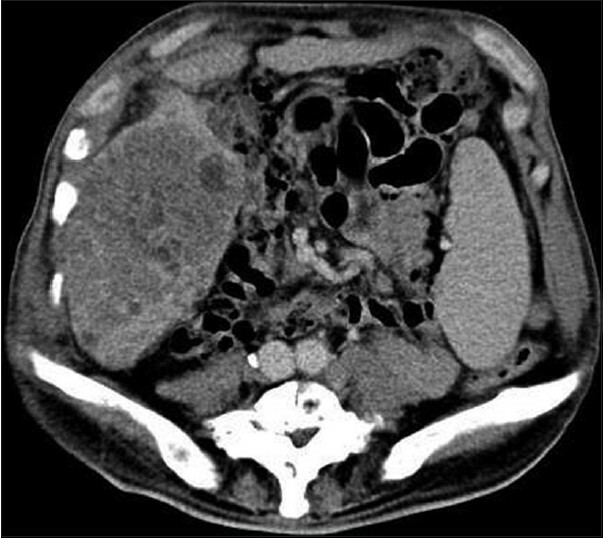 Postembolization bowel ischemia or necrosis was not observed in any of the patients who received TAE with Onyx. Conclusions: TAE with Onyx is a highly effective and safe treatment modality for acute gastrointestinal tumor hemorrhage, even with pre-existing coagulopathy. Objective: The aim was to evaluate the feasibility and safety of early chest tube removal after complete video-assisted thoracic lobectomy (CVATL). Methods: Retrospective analysis was performed on effects of chest tube removal on patients with lung cancer after pulmonary lobectomy between November 2013 and October 2014. 154 eligible patients included 97 cases for CVATL and 57 cases for open thoracic lobectomy. Patients with CVATL were divided randomly into experimental group (EG) and control group (CG), in which 51 patients in EG had chest tube removal on the 2 nd day after operation; 46 patients in CG had the tube removal when the drainage volume <100 ml/day. Patients in open thoracic lobectomy group (OG) had the tubes removal as CG. The drainage volumes of the 1 st and 2 nd 24 h after operation, duration of chest tubes, cases of pain alleviation, and recurrent pleural effusions requiring reintervention were measured. Results: The average drainage volume of the 1 st 24 h after operation of CVATL group from EG and CG was significantly reduced than that in OG (260.41 ml vs. 353.16 ml, P < 0.001). The average drainage volume of the 2 nd 24 h after operation of CG was significantly reduced than that in OG (163.91 ml vs. 222.98 ml, P < 0.001). The average duration of chest tube of CG for 2.98 days showed significant different compared with OG for 3.81 days (P < 0.001). Chest tube removal in CVATL group increased more chest pain alleviation than OG (80.4% vs. 56.1%, P = 0.001). The frequencies of recurrent pleural effusions requiring reintervention were 5.88% (3/51), 4.35% (2/46) and 5.26% (3/57), respectively, which had no significant differences between three groups (P = 1.000). Conclusions: Complete video-assisted thoracic lobectomy brings less drainage volume after operation. Early removal of chest tube in CVATL shows feasible and safe and demonstrates that it may reduce postoperative pain and help fast recovery. For thoracoscopic upper lobectomies, most cutting endostaplers must be inserted through the camera port when using a two-port approach. Access to the hilar vasculature through only the utility port remains a challenge. 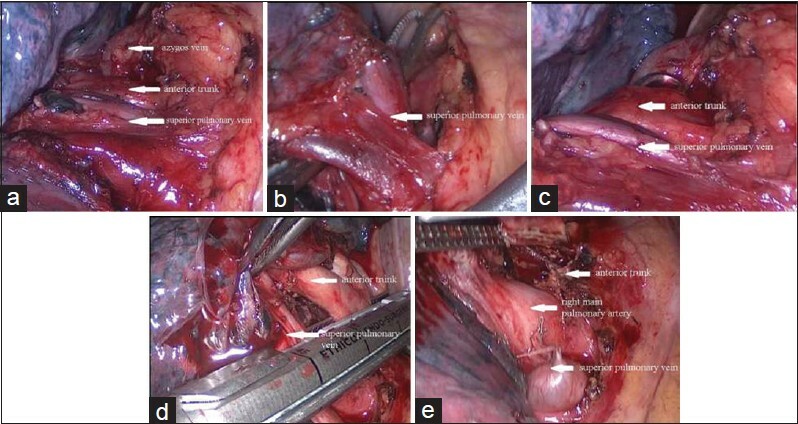 In this study, we describe a procedure to access the hilar vasculature without transferring the endostapler site during a thoracoscopic right upper lobectomy. A 2.5-cm utility anterior incision was made in the fourth intercostal space. The posterior mediastinal visceral pleura were dissected to expose the posterior portion of the right upper bronchus and the anterior trunk of the right pulmonary artery. The pleura over the right hilar vasculature were then peeled with an electrocoagulation hook. The anterior trunk of the right pulmonary artery was then transected with a cutting endostapler through the utility port firstly. This crucial maneuver allowed the endostapler access to the right upper lobe pulmonary vein. The hilar structures were then easily handled in turn. This novel technique was performed successfully in 32 patients, with no perioperative deaths. The average operation time was 120.6 min (range 75-180 min). This novel technique permits effective control of the hilar vessels through the utility port, enabling simple, safe, quick and effective resection.